STAR is Special Transit Available by Request; a Para-transit service offering transportation alternatives to people whom at certain times cannot use, or have substantial limits using, the CDTA fixed-route bus system because of a disability or impairment. 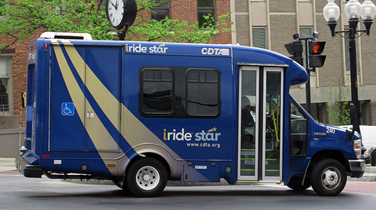 CDTA provides eligibility for complementary paratransit service to individuals who live outside of the STAR service area but they can only receive STAR service for travel within the service area. It is complementary to CDTA’s fixed route bus system. It operates within 3/4 of a mile of a CDTA’s fixed route bus system on the same days and times that CDTA’s fixed route bus system operates. For example, if a CDTA bus operates from 6AM - 7PM, Monday- Friday along a specific route, then STAR is available from 6AM - 7PM, Monday- Friday within 3/4 of a mile on either side of that route. It is a shared ride, providing origin to destination rides for work, appointments, shopping and social activities. Remembering that STAR is a complimentary service, trips requests with origins and/or destinations beyond these route corridor boundaries and/or beyond the service times of the corresponding fixed route will not be accepted. The ADA defines “prevents or prevented travel not only where travel is literally impossible, but also where the disability substantially limits one or more major life activities". Please note that the seats at the front of every CDTA regular route bus are for senior citizens and people with disabilities. Please relinquish these seats if they are needed, or if you are requested to do so by an operator or supervisor. CDTA is committed to providing mobility services to everyone in the Capital Region. We are proud to offer a variety of solutions for those who need assistance or special accommodations. Seniors and those with disabilities pay half-fare to ride regular fixed-route buses. Low-Floor buses operate on all CDTA's regularly scheduled, fixed routes. For more information about the service or the certification process call (518) 482-2022. Schedules and information are available upon request in large print, Braille and audio formats. Please call (518) 437-8378 or email Tanya tanyap@cdta.org for your accessible materials requests.